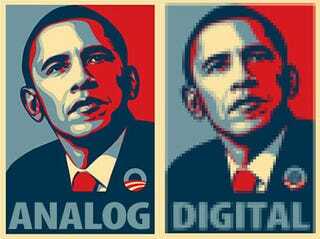 President-elect Barack Obama has asked Congress to stop the shut down on analog TV broadcasts, due on February 17. The main two reasons: "Inadequate funding" and problems with the converter box program. But there's more. John Podesta, co-chair of the Obama-Biden transition team, requested that "the cut-off date for analog signals should be reconsidered and extended". The letter was sent this Thursday to the chairs and ranking Republicans on the House Energy & Commerce Committee and Senate Commerce Committee. Probably realizing that the Roman Emperors were right with their "bread and entertainment" policies, Podesta also argues that Americans can't wake up 28 days after the inauguration "to find their analog TV's no longer able to receive an over-the-air signal". Indeed. I can see exactly what he means here. Not only it is true that the analog to digital TV program is broken, but I can already imagine people getting up in arms, thinking that the world is over after "the muslim" got into the White House: "Whar's mah TV? This ain't wawkin'! ah knowed thet guy warn't enny fine! Fry mah hide! Kids, t'th' shelter! Git mah rifle!"